With O.D.D. in financial trouble and without a place to operate his business, Bill Tracy had to find a way to continue his career in the dark ride industry. In 1964 Bill Tracy developed a business relationship with Universal Design Limited, a company based in Wildwood, New Jersey that was known for their monorails and sky towers. UDL saw a business opportunity with Bill so they created a Dark Ride & Display Division. Bill was the head of this division and was able to design and install dark rides under their name. He was able to use their resources and their facility, which was located at the County Airport in Wildwood. 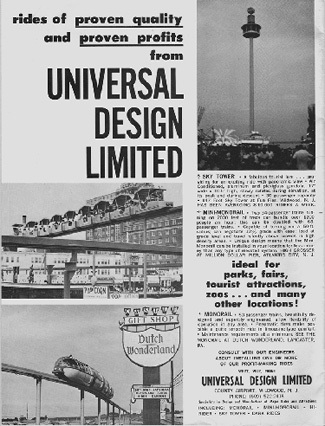 UDL ad, as published on the back cover of the May 6, 1967 issue of Amusement Business. Hour 13, a two-story dark ride that was once a star attraction at Miracle Strip Amusement Park in Panama City, Florida, opened in late March of 1965 and was one of the dark rides that Bill Tracy built under UDL. The new concrete block building for Hour 13 was 60 feet by 100 feet in dimension and included 534 feet of track. Hour 13 featured an enormous winged dragon on the façade and an interior stunt entitled “Alone Again: Old Mother Hubbard.” This stunt featured a ghastly woman sitting at the dinner table while nodding her head at the remains of her devoured pet. 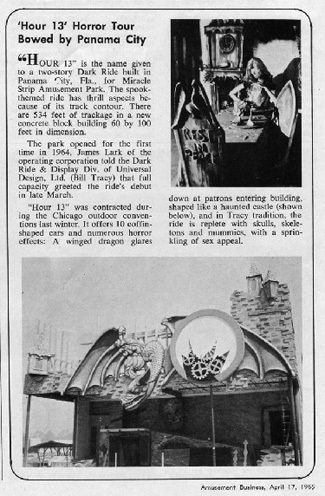 Article featuring Hour 13, as published in the April 17, 1965 issue of Amusement Business. Ghost Ship, another two-story dark ride that Bill Tracy built under UDL, opened on June 18, 1965 and was one of the original attractions at Ocean Playland in Ocean City, Maryland. UDL also installed a hi-rider and monorail at Ocean Playland for the amusement park’s inaugural season. The façade of Ghost Ship featured a large spider octopus with a skull head in front of a doomed pirate ship, which the ride cars passed on the second level exterior balcony. The interior had a nautical theme and featured stunts such as Head Slinger and Sea Sick Pirate. Head Slinger depicted a disoriented man standing in a doorway at the top of some stairs and then, with a loud scream, his head would appear to detach and fly toward the rider. Sea Sick Pirate showed the backside of a nauseous pirate leaning over the railing of a slowly rocking ship. Ocean Playland, including Ghost Ship, unfortunately closed in 1981. After Ocean Playland closed in 1981 Granville Trimper bought the remnants of Ghost Ship to be used on his own property. Much of Ghost Ship, including parts of the façade, the ride system, and most importantly, Bill Tracy’s nautical stunts, were then used in 1988 when The Haunted House at Trimper’s Amusements, also in Ocean City, Maryland, was converted to a two-story dark ride. Bill continued to do business under UDL until 1967. < Part VI - Outdoor Dimensional Display Co., Inc.